Silks are a beautiful art form made famous by Cirque du Soleil. Silks are a challenging “vertical” workout that will tone, tighten and recruit every muscle in your body. You will lean to defy gravity as you climb, flip, wrap and drop in these gorgeous silk ribbons. 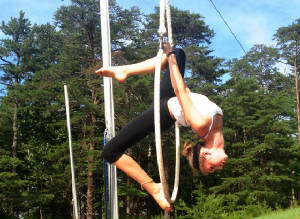 This is a workshop for anyone who is interested in learning the basic skills of aerial silks. You will learn basic climbs, foot locks, poses, as well as strength training. Must be able to do a pull up and hold your own body weight. What to Wear to your Silks Class? What not to Wear to your Silks Class? Hoop Lyra is a beautiful Aerial Circus apparatus class that is performed on a suspended metal hoop. It’s a challenging workout that teaches you grace, strength and power as you pose, flip, hang suspended in the in the air. Leggings or tights that cover the back of your knees are required as you defy gravity in this class. Aerial Hammock blends the ancient form of yoga with equal part of aerial arts. Students begin with a warm up stretch on the matt - preparing to suspend their bodies in a soft fabric hammock. The hammock allows for deep stretching, strengthening and release as certain body parts are being supported by the hammock. This method helps to target specific areas of the body to achieve maximum results. Shoulder and torso strengthening is key so proper alignment can be achieved in a suspended movement. Students are carefully guided into the “art of inversion” and all that encompasses being upside down to achieve healthful benefits, such a decompression of the spine. Aerial Hammock is a good way to invert your self into new perspectives. Come hang out in one of our Aerial Hammock classes. Great and Fun for kids and adults. Spanish Web is an aerial apparatus consisting of a rope with a loop attached to it. Web is done with a participant (who is in the air being spun) and a setter (who is on the ground). In this class you will learn to climb and be suspended from your wrist and possibly your foot. While spinning you will learn to transition from and into various poses. You may also learn to set the web, which is an important part of the art of Spanish Web. Its recommended to wear tight fitting clothing. See picture to the left for clothing example. Long tights with foot hole are great as well. Must be able to do two pull ups. Class is great for strong kids and adults.